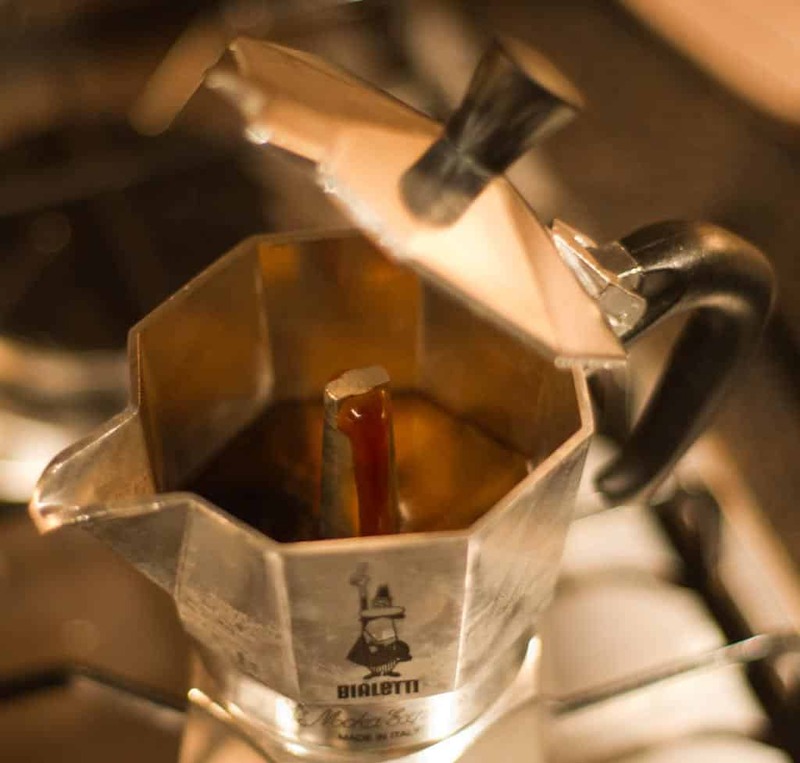 What is a Moka Pot anyways? Basically, a Moka Pot is an appliance in which it uses pressure (similar to how pressure cookers work) to brew coffee. Traditionally moka pots are made from aluminum due to aluminum’s ability to easily distribute heat evenly and because it’s so much more affordable. For instance almost every best selling moka pot is made from aluminum and they all cost very little. See any of these pots top see prime examples of what I’m talking about. These days it’s easy to find many different aluminum pots as demonstrated above but there are more expensive stainless steel pots which are touted as being more durable, safer, and better tasting by many home baristas. the Cuisinox Roma Moka Pot. But are the stainless steel versions really worth their higher price tag? The best selling moka pot is still made from aluminum and even though aluminum pots can change the taste of the coffee they produce they are much easier to care for and sealing the aluminum is dead simple. For starters both types of espresso makers are built the same. The pot itself has three distinct chambers and the filtration and safety valve are exactly the same. The first chamber is located at the bottom and is filled with water. The pressure built up in this chamber allows the water to rise and flow through the second chamber. The second chamber is funnel shaped wherein the ground coffee is placed here. The reason it is funnel shaped is because the water, when boiling, rises through the funnel to reach and brew the ground coffee in the middle chamber. Of course, this middle chamber has small holes to prevent the ground coffee from falling into the first chamber as well as to allow the water to go through the second chamber. The third chamber is where the brewed coffee is collected. Now, the shape of the third and top chamber is a sort of reverse funnel wherein there is a tall funnel in the center from which the brewed coffee flows. As a result, the brewed coffee is much hotter than when brewed in a standard pot, due to the superheated water resulting from the use of pressure. See this post for more on the difference between stovetop espresso and real espresso. Because stainless steel doesn’t conduct heat as efficiently as aluminum you are far more likely to get uneven extraction in a stainles steel pot and the gaskets in your steel pots will probably be more likely to need replaceing more often. Even in a top of the line stainless pot like the Vev Vigano Carioca the steel base must be perfectly situated on a burner to help distribute the heat around the pot evenly. If one side gets hotter than the other then this will negatively impact your brew… if you leave the pot on the burner to long then one side of the gasket may burn while the other side remains in good shape. Stainless steel is a more durable metal. It’s going to hold up better over time while aluminum can be banged up a little bit easier. Stainless steel wont conduct heat as efficiently as we’ve already noted but it will be a tiny bit safer to use on the health-front as aluminum can impart extremely small amounts of trace metals into your coffee if the pot is not well seasoned. Aluminum pots are a lot lighter and cheaper than steel so they are easier to handle and afford… and even though they are made from aluminum better pots are still quite durable. Because aluminum distributes heat better coffee is easier to brew in an aluminum pot and when seasoned cleaning them is as easy as rinsing water through the pots after use. In fact most of our favorite small stovetop espresso makers are all aluminum! One other perk of aluminum pots is that the pieces of aluminum pots are far easier to find when it comes time to replace a part. 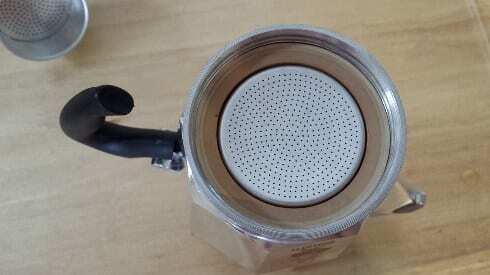 Simple replacement gaskets and filter screens can easily be found for even cheap aluminum pots from brands like Primula where as you would find it much harder to find an acceptable replacement gasket for a pricey Alessi moka pot. Do Stainless Steel Moka Pots Taste Batter? One significant aspect of aluminum pots many people don’t like is that at high heat aluminum imparts some metallic “tastes” into the coffee produced. It’s clear the aluminum levels that leech out of the moka pot is safe for human consumption but the flavor is impacted negatively. Stainless steel will not do that. To combat the flavor distortion common practice is to never fully wash your aluminum moka pot with abrasives and soap. Instead immediate rinsing of the moka pot under hot water and non-abrasive cloths are best because this removes the coffee and grind from the pot but leaves the coffee oils on the metal surface to seal the pot. It is not uncommon to see Bialetti’s all over the world that all look a bit grungy. The metal is sealed and this makes the coffee taste better. So Why Not Use Steel Over Aluminum? You wouldn’t want to do this because steel causes hot spots due to uneven heat distribution. The aluminum models simply work better on an incremental level… you just have to get over the idea that they need to be scrubbed down with soap after every use. Of course this is something not everyone can stomach which is why we are happy to advise some of our customers to buy a good stainless steel moka pot instead even though they cost a bit more. All Moka Pots are equipped with gaskets that ensure that there is a safe build-up of pressure in the lower chamber. Since the Moka Pot separates into three, the gaskets are there to hold the chambers together while also keeping pressure from escaping through the separations. Moka Pots are also equipped with safety valves. These valves are another avenue from which steam escapes. Of course, Steam can only escape through these safety valves in the case of intense build-up or in other words, too much steam is accumulated in the lower chamber. The Moka Express has it’s own special patented valve making it one of the safest pot on the market. You can see our full review of the Bialetti here. On the other hand, a clean filter in the second chamber will prevent unnecessary steam build-up since this is the main pathway where steam will pass through. This will also ensure that the coffee is finely brewed. In addition, some recipes state how much water to use per amount of coffee bean. This ratio is very important is this plays a huge role in the outcome of the flavor of coffee. Knowing to use how much water also serves another purpose. This keeps the pot from generating too much pressure which worsens the quality of the coffee and poses possible damage to the pot. Coffee Characteristics of the Moka Brew – Is the Flavor Different? You may now be wondering how different coffee tastes when brewed using a standard pot or coffee maker as compared to using the Moka pot. For starters, the taste and flavor of coffee generated by a Moka pot greatly rely on several factors such as the type of coffee bean, roast level, how fine the grind is and as mentioned, the amount of temperature in the pot. The design of the Moka pot, in which it uses superheated water and pressure to brew coffee, results in a stronger flavor as compared to the standard pot and drip brewing. This is because there is more caffeine present in the brew of Moka pots. Moka pots also generate more crema or foam as compared to other brewing mechanisms (aside from true espresso of course). Due to the extraction rate of the Moka pot, meaning the amount of coffee brewed, most people commonly mistake the Moka pot as a variation of an Espresso machine. This is not the case since Moka pots generate a PSI of 29 as compared to 130 of Espresso machines. Thus, Moka brews are not classified as Espresso and should be considered as distinct type of coffee brew in itself. Because all stovetop espresso makers are generally well priced and affordable to the masses we always advise our customers to buy a good model and avoid the super cheap models. Here is a list of our favorite large stovetop espresso makers, each of which is perfect for making moka for 2-4 people every morning. Moka pots were traditionally made of aluminium due to its malleability, making the crafting process of complex shapes and features much easier compared to when using thicker metals such as steel. There are still Moka pots available out there on the market but manufacturers such as Alessi, Serafino Zani, Vev Vigano and Bellman have now designed Moka pots made of stainless steel apart from their aluminium offerings. The pots practically offer the same features and functionality but do both materials actually contribute to users in terms of taste and safety? This question can be answered through the comparison of four benchmarks discussed below. Corrosion – Stainless steel possesses a certain element called chromium which provides corrosion resistance. Also, stainless steel is non-porous which means that its surface does not have even the smallest holes. This characteristic only increases its corrosion resistant capability. Aluminum on the other hand is prone to corrosion especially when experiencing oxidization, brought upon by acidity. Since we are talking about coffee here, yes, coffee is acidic and thus corrodes aluminium at a much faster rate. This chemical reaction of oxidization leads to rusting. Heat transfer – Aluminum, due to its more basic composition (less layers as compared to stainless steel), means it is a better conductor of heat. This means that it takes aluminium made Moka pots less time to brew coffee compared to stainless steel ones. Strength – Stainless steel is stronger than aluminium based on the fact that its malleability is less compared to the other metal (same reason why Moka pots started as being made of aluminium). Stainless steel is also sturdier than aluminium and as a result, is more durable given that both metals experience the same amount of pressure. Cost – Aluminum is the cheaper to acquire and manufacture between the two. Based on the breakdown above, one should definitely opt for a stainless steel pot. The health scares are primarily rooted in corrosion in which stainless steel is more resistant. Also, due to stainless steel’s durability, it is more likely to withstand the intense pressure generated by the lower chamber. Taste-wise, both pots go either way. As mentioned above, the flavor generated by a Moka pot really depends on the aforementioned factors and thus, the characteristics of aluminium and stainless steel pots have no room in the discussion. If one is looking for a more traditional tasting Moka brew, one should then opt for aluminium pots since traditional Moka pots were made of aluminium. Of course, one should always keep in mind that hazards that go along with it.